Handmade puppets provide hours of entertainment. Puppet themed crafts provide hours of entertainment for both the young and the young at heart. Making your own puppets is a great way to stretch your creative muscles. Children love the farm and the animals at the farm. This activity is a great way for young learners to explore dramatic play and use their imagination to tell a story. After you print out the finger puppet templates, help your child put their puppets onto a finger. Then have each child tell you what he knows about the animal, how it sounds, what it eats, etc. Finally, create a puppet show about the animal that lives on the farm. An additional craft idea is to take an old shoebox and have the child create a scene for the puppet show to take place. Have the child use markers, crayons or other supplies to decorate it as she wishes. Legends and Lore has basic tutorials for making sock and sack puppets. Family Fun is a great resource for anyone interested in puppets. This site has a large index of puppet crafts, including both animal and people puppets. DLTK Kids has wonderful ideas for anyone interested in making paper bag puppets. Sunnie Bunniezz has printable patterns for decorating paper bag puppets, although you could also use the pieces to decorate other types of puppets as well. Making Friends offers a number of suggestions for helping preschoolers and younger elementary school students make their own puppets. Wiki How has a simple wooden spoon puppet craft that would be a fun classroom activity. Danielle's Place has directions for easy to make sock puppets, including a camel, bug, caterpillar, and goose. 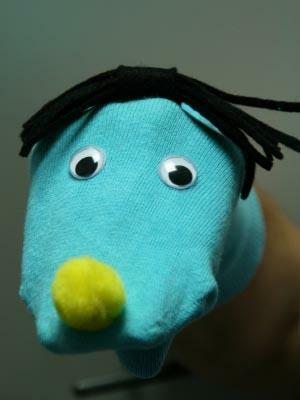 Artists Helping Children has a listing of puppet crafts from around the Web, including several that incorporate recycled materials. Disney offers cute printable puppets featuring several of your favorite characters, including Mickey, Winnie the Pooh, Snow White, and Sleeping Beauty. Enchanted Learning has a small assortment of printable finger puppets for children to decorate. 101 Hand Puppets provides many unique puppet ideas, but most projects will be too complicated for young children to do on their own. Remember that making your own puppets is supposed to be fun! Don't feel compelled to follow the directions in a project exactly. Feel free to substitute supplies or make alterations to create a one-of-a-kind puppet themed craft. Every puppet needs a stage for his or her performance. Purchasing a puppet theater can be expensive. Luckily, it's not too difficult to make your own. Simply cut a window in a large cardboard box, then decorate it with crayons, markets, glitter, stickers, and other embellishments. If you don't have a large enough box handy, tack an old sheet across a doorway to give children a suitable spot for their show. Tell a favorite fairy tale. Put on an episode of your favorite TV show. Show what you like to do with your friends at school. Reenact a day in the life of your family. Imagine what would happen in a family if the children were in charge and the parents had to be told what to do. Describe how your life would be different if you had superpowers. Tell how you imagine a typical day will be when you're all grown up. If you're looking for a more formal puppet show script, the Creativity Institute Web site has links to several puppet show ideas appropriate for young performers and their audiences.